Eye Care Associates of Princeton is proud to offer CLARIFYE℠. Eye exam technology has been the same for decades—but not anymore. 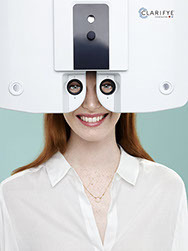 CLARIFYE℠ is the new digital eye exam that shows you much more. During your exam your optometrist uses advanced, digital equipment to map the unique “fingerprint” of your eye. The exam is detailed and comprehensive, and every step is personalized just for you. Best of all, its digital precision means less guessing between “which is better, 1 or 2?” No other eye exam is more precise. And it’s exclusively at or next to LensCrafters. Call Eye Care Associates of Princeton today to schedule an appointment. CLARIFYE℠ is available only at Eye Care Associates of Princeton and selected LensCrafters locations.